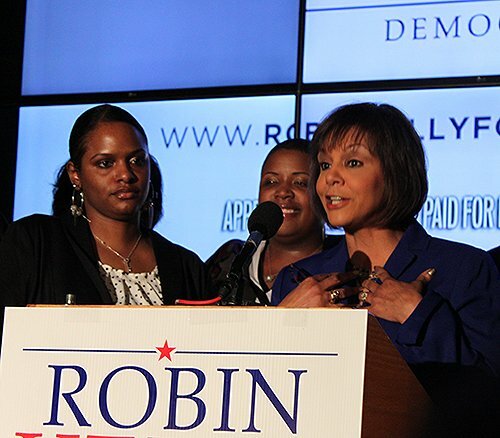 Robin Kelly delivers here acceptance speech surrounded by supporters. Democratic candidate Robin Kelly has been elected to take disgraced former Congressman Jesse Jackson Jr.'s seat in the 2nd congressional district in a race shaped by gun control and low voter turnout. The election was called less than an hour after polls closed Tuesday night. As of 1:30 p.m., roughly 8 percent of the residents in the district showed up to the polls on Election Day. That’s compared to about 10 percent at the same time that turnout was sampled for the special primary election in February. Despite the low turnout, Kelly won with 85 percent of the vote. Republican candidate and ex-offender Paul McKinley followed with 10 percent of the vote. Green Party candidate LeAlan Jones came in third. "There was whole lot of people that counted us out … naysayers who said we couldn't win." Kelly in her acceptance speech. "We not only won an election, we took on the NRA." New York Mayor Michael Bloomberg's Super PAC funded more than $2 million in TV attack ads on Kelly's primary opponent, Debbie Halvorson, and Halvorson's pro-NRA stance. Although Halvorson admitted the ads played a critical role in her defeat in the February primary elections, Kelly says she attributes Tuesday’s victory to her own efforts and the hard work her staff and volunteers. The message of gun violence had been a key platform during Kelly’s campaign for the 2nd Congressional District's special primary election. Her message remained the same, Tuesday. "To those who say that we won't be able to make congress do anything on gun control, who think the tea-party congress can't be beaten,” she said. “I've got two words: watch us"
Nathaniel and Cleopatra Pendleton, parents of 15-year-old honor student Hadiya Pendleton who was shot and killed earlier this year, stood behind Kelly as she gave her victory speech. Kelly said in her speech that there’s a lot to be done in her new role. But her first priority is to focus on constituent services. Kelly will be the 98th woman to hold a congressional seat and the 75th Democratic woman to serve in the district.